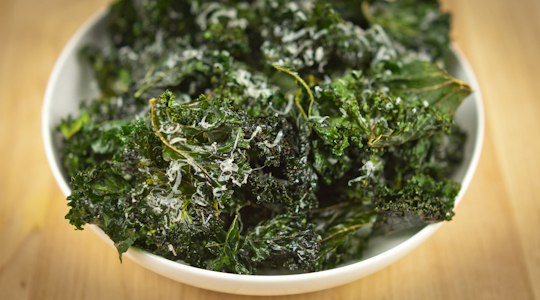 Kale chips are a real revelation if you haven’t tried them before. We’ve all heard about Kale’s now legendary superfood status but you don’t have to blitz it into a green smoothie to get it’s vitamin packed benefits. If you’ve got crisp cravings, these really do scratch that itch with their salty crunch, but with none of the carbs and tons of fat carried by your usual packet. You can have these on the table within 20 minutes so there’s no excuse not to give them a try. Variations: You could try adding extra flavour with smoky paprika, cayenne pepper, or any dry spice rub that takes your fancy. Wash and completely dry your kale, removing it from the tough woody stems and discarding them. Tear the kale into bite sized pieces and rub in the olive oil, massaging it into each piece in a large bowl. At this stage, add the salt and any extra seasonings you want to try. Spread the kale out over a baking sheet lined with greaseproof paper and bake it in the oven at 200 degrees for 6-8 minutes. Toss the kale halfway through cooking. When you get it out, the kale will crisp up as it cools leaving you with a virtuous, healthy and incredibly satisfying snack.